This book is based on the fortunes of a coal miner, the family who own his mine and the family who live next door. Not content with being a miner all his life and wanting something better for him and his twin sister he seeks a way of finding his freedom. He writes to a lawyer in London who informs him that the law is on his side and that of all miners. As long as they don’t work more time than the law allows they can choose to be free. Only as a mine owner with wealth and standing you naturally wouldn’t want your workers to find out they can be free so they seek to quash him. As time passes they realise letting him go whilst giving the appearance of him escaping is the best thing to do to ensure that the rest of the workers toe the line. Time passes and their fates are entwined again in London years later. A marriage now on the cards between the two wealthy families but a connection remains between the wayward miner and the head of the neighbouring house. She who aided his escape when it looked like he might drown in the river on the night he escaped to his freedom. Fate keeps bringing these elements together and even when it looks like the mine owners have finally broken him they end up taking the problem with them to the new world of America. As a marriage gift and under some duress the mine owner grants his second son by marriage a failing tobacco plant in Virginia in the hope that he and his headstrong wife will disappear and allow him to rescue his failing mining business by mining her neighbouring land, something she would never agree to. The family in addition to mining have a shipping business, sending convicts as slaves to wealthy British landowners in Virginia willing to pay for labour or to purchase a British wife. The married couple end up claiming the miner as a labourer for their land. Along with the man who plotted with the noble families to get him arrested and convicted in the first place. As you can image this doesn’t work out well for them. Not least because they won’t listen to the tried and tested methods of the families around them who are making their plantations work. The wife seeks to learn from them and better the position of their plantation but as a female her voice is drowned out by male pride and prejudice. When she looses her child it is the miner and not her husband who comes to her aid, he who showed himself to be trustworthy throughout her life compared to the man she married who plotted against her and allowed stubbornness and ignorance to make their position more unsalvageable. When the harvest fails and he is left bankrupt with no prospect of borrowing money a glimmer of hope appears to him in the form of his mother. 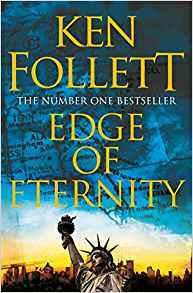 Travelling across the ocean to deliver news of his fathers passing and a way of accessing vast sums of money and the inheritance his father denied him throughout his life. His father believed that the wealth came from the family of his first wife and as such only promised it to the son from that marriage. But in the background his jealous brother plotted with his father against him. They allowed the noose of his vices to push him into debt and despair so that they could leave him broken and destitute. That is unless he has a child before a year passes from his father’s death. His mother bringing this news in the same breath as telling him that his wife has left the plantation for good with none other than the miner. He gathers his meanest men and head off the beaten trails looking for his wife. If not to bed her and bear a child but to murder her so he can bed a more willing girl, marry her and claim his inheritance. After days of tracking them the parties meet on reservation lands. One group to fall to their fate, the other to find their freedom. 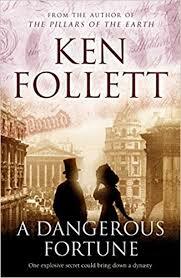 I wasn’t as engaged by this book as I have been with other Ken Follettt books but it was still a good story. 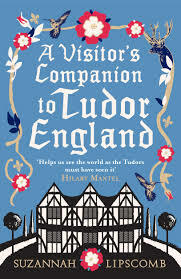 I find the Tudor Period interesting and this book was a nice take on where to visit in England to experience the remaining architecture and points of significance. Its written in a way that connects you to the Tudors, explaining where they visited and the significance of the designs they chose to surround themselves with. In Elizabethan times for example houses were built-in an E shape in the hope that the Queen would grant the owner a royal visit. Although this was a double-edged sword as the cost of a royal visit ended up bankrupting some of the loyal subjects. But the promise of climbing the social ladder and reaching a status above what you were born into and pass on to generations of your name was what drove the noble to fall over themselves in support of the monarchy. I have visited some of the places in the book and added some to my bucket list of places to visit. But the thing that struck me that I overlook when I visit these places is that I may well be standing in the same spot Henry VIII or Elizabeth I stood and in that moment I connect with the past. Although I’m sure the external views will be dramatically different and the houses are cleaner and more hygienic now, the past is sometimes a nice place to get lost in. Although I’m not sure any of us would want to live there forever. If you are interested in the Tudors or architecture and you’re looking for some new places to visit this book will certainly give you a few ideas. 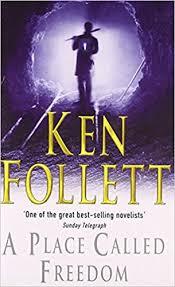 I saw the movie of this book when it was in the cinema which was a good few years ago now so when I was reading the book I was picturing the actors in the film. I couldn’t remember who played the lesser characters, I could only picture the main ones which I guess is fitting. It’s such a unique story, you don’t get many books written about the American travelling rail road circuses of the 1920/ 30’s and yet as you read it you wonder what other untold stories there are. A circus is a wonderful sight with animals and humans performing together but sadly something that is not so acceptable in the modern world. At their height when there wasn’t such a wealth of entertainment available at the touch of a button they were something to see. Imagine not having a TV or the internet but knowing that once a year the circus will pull into your home town and entertain you with animals you’d never get the chance to see in your life turning up on your doorstep. I can imagine how exciting that must be. The book uses elements of stories from a range of circuses of the time and elaborates to fit the narrative. Including the effects of the liquor ban and the unscrupulous moonshine makers who ended up killing hundreds of thousands of people with poisonous liquor. But it’s the way the book brings to life the Elephant, Rosie that keeps you hooked. It reaches into the heart of that huge animal and displays an almost human like manner. It refers to her smiling at Jacob and an understanding between the two of them once he realises she speaks Polish. It’s hard to imagine an animal only being able to understand one language but a lot of humans only understand one language, the one you were born into. So I guess an elephant raised as a cub in Poland, connecting sounds to actions is not that far-fetched an idea. In no way could she be seen as a dumb animal given how naughty she is when she’s misunderstood. 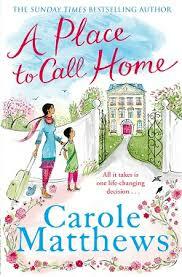 It’s such a heart warming story with elements of sadness and how very real and ugly life can be for some people. I’m not sure if reading the book without seeing the movie paints as vivid a picture but I certainly enjoyed it having already seen the film. I couldn’t remember everything that was going to happen as it was such a long time ago since I saw the film which was nice. I would recommend both the film and the book. Finally a World Cup that everyone can get behind!! It’s a tough call so I’m not sure what book I’ll be voting for, I don’t really have an out-and-out favourite. You can find out more and find out how to place your vote by clicking on the link below. I’m a fan of war movies, I watch quite a lot about all sorts of battles and one thing I love about them is that they teach you things and give you a better understanding of how the world works. That is where I feel this movie was a let down. I thought it was good but not great. I’m not quite sure what all the 5* reviewers saw that I didn’t but clearly we have a gulf in opinion. If you don’t know the history behind what happened at Dunkirk you learn very little from this movie. There is no customary written intro and exit heralding the figures of such an achievement of human spirit and determination and I think that was greatly missing. I would have loved at the end to know how many men were on the beach, how many returned, how many ships, boats and vessels retrieved them, how many planes covered them and a summary of what happened next. I think if you are highlighting a movie about what happened over the course of I think a week so important in history, that you could have taken the time to add a couple of written slides at the end giving you the figures. I honestly don’t think any other country could have pulled off what we did that week. A call goes out that Englishmen are stranded on a beach in France and as many ships, boats, ferries and the like that can manage it head across the sea into a war zone – unarmed and unprepared with a moments notice, risking their own lives and livelihoods to bring them back. That is what needed to be made more of in this movie. For those people sailing across most of them used their boats for work, if they got sunk or were killed that risked the lives of their families and the people who relied on their business. That is a hell of a thing. I know a lot of the ships were commandeered by the British Navy but I believe a lot of people joined in regardless to help out. The movie made reference to the fact that we brought French soldiers back but I haven’t heard this before. Not that it showed you any French soldiers returning, the leader makes reference to them having to wait. The one thing the movie lacks is the rawness of the situation given it shows no real injured soldiers, there are no dead bodies, even in the sea there is minimal floating debris and bodies following the sinkings. It shows the beach being bombed and the explosions and yet everyone gets up and back into line. When all the ships have gone the beach is empty, which is unrealistic. There was reportedly around 400,000 men on that beach, there would have been weapons, vehicles, dead bodies, rubbish, shrapnel and all sorts lining the beach. Anyone who has lived with a man knows how much mess they can make so you can’t tell me 400,000 of them left the beach completely clear. The flashback sequences weren’t very obvious either. It took me a minute to realise we were seeing the same part again from a different perspective and it was annoying a couple of times. I don’t think it’s accurate that only 3 Spitfires were sent out to protect the boats. I know they wouldn’t have used everyone but 3 seems a bit light. Also due to the flashbacks it seems a Spitfire can drift for an extraordinarily long time with engine failure and damage. Seeing the WW2 planes now gives me goosebumps, I can’t imagine how those men in the ships and fighting on the beaches and fields felt as those wings flew over to protect them. They really were a feat of engineering and without them we would have lost the war. As a film it told a sanitized story of war from the perspective of the sea, beach and air. I don’t doubt it was based on things that happened and there were elements of risk shown but I think it could’ve been more realistic. I also wish they’d added an educational element at the end for all the young people watching who don’t know much about WW2. For me it was good but I like a little bit more grit in my war films. From the start my enjoyment of the movie was spoiled by the kid behinds constant need to kick my seat and put his feet on the spare seat. When I was a kid my parents wouldn’t have let me do this and it annoys me that no one says anything to kids nowadays when they behave badly. Despite me voicing my annoyance and him sitting next to an adult they didn’t even try to stop him kicking the seat. There is no need to put your feet on the seats or keep kicking someones seat, especially when you have enough leg room as it is, it’s just rude and inconsiderate of the people around you. The world could use a little more consideration and a little less self-importance. If you don’t learn consideration as a kid you certainly won’t learn it as an adult! However, despite the rudeness of others I did enjoy the movie. It had the usual amount of silliness but there was enough to keep adults entertained too. Gru meets his long-lost twin brother and the two of them undertake a heist together following in their Dad’s footsteps. It was everything you would expect a Despicable Me film to be. Including a hunt for unicorns, I mean who hasn’t wanted to meet a unicorn?! 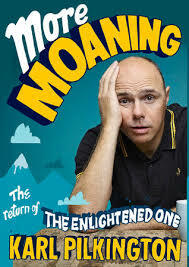 This book is another companion to the Moaning of Life Sky 1 series that Karl Pilkington creates. Had you not have seen the TV series you would still be able to follow the book as it includes still shots from the show. The book is basically a guide for what happened behind the scenes and why he chose to explore the avenues he did in the TV show. I think this one covers the second series of the Moaning of Life and included some very weird and wonderful practices carried out around the world. It’s a nice easy series to watch, you learn a few things and have a few laughs and the book is much the same. Sometimes you just need some light entertainment for your mind and this sort of thing is perfect for that. If you’re not a fan of Karl and his wonderful way of viewing the world then this book really isn’t for you! This is the final book in The Century Trilogy starting in 1961 and bringing you right up to date with world affairs. I loved the whole of the Trilogy and I think I learned a lot from how wars were undertaken and the effects they had on different people from all around the world. In this book when they talk about the assassinations of President and Bobby Kennedy I developed a new understanding of the impact of the events on the time. I think like most people I have an interest in finding out what really happened to the Kennedy’s and I’ve watched numerous TV shows and documentaries portraying the family from the inside but also analysing the events of the shootings and no one seems to agree on anything. For someone born almost 20 years after the assassinations I still find it interesting. That is the thing with history, it has always piqued my interest and books like this series allow me to understand events in a human way that teaching and documentaries don’t offer you. The characters in the book are just that and I’m sure what happened to them is based on facts that happened to people at the time but I don’t think such a small demographic of people could have been so unlucky to have so much sadness happen to their families. I also don’t doubt that the historical evidence in the books are also heavily based on facts and some of the people are undoubtedly real but by adding characters to real situations you make what happened human rather than a history lesson of fact. I think it’s a better way of teaching and the school curriculum should look to ways of making what you learn much more real-time for today’s world. Young people now are very much digitally minded as opposed to us who went to school before the internet who are still wired to learn in an analogue way deep down. A lot of the kids of today will turn their back on books because they don’t provide instant gratification that can be found in a YouTube video and I think it’s a shame. As a child I would read multiple books at a time and a trip to the library always resulted in armfuls of books and borrowing space on other family members cards so I could get everything I wanted. I think a lot of kids today are missing out on knowing the excitement of that simple thing. If you are interested in world history but don’t want to read historical books which can be very technically challenging then this series is perfect for you. You’ll come out with a whole new understanding of the mentality of war and how power corrupts people’s thinking and it is often the poorest people who suffer. The world is ever changing but one thing that has never been learned is how pointless war is in the long-term. All wars at their heart punish innocent people, in the ideals of those in power, trying to enforce their decisions on the wider populace. War is a money-making game to the big government powers and that is what will always fuel the conflicts. The big superpowers would all be poor in peace and that is a sad reality of life. The older I get the more I am becoming accustomed to terrorism as a part of life and for anyone to say that is a sad view on what humans have become. That anyone thinks they have a right to kill people with different beliefs because it is their gods will, misses the point of religion. All religion is based in the hope that if we live by a certain set of rules we will be granted a restful afterlife, it is designed to stop people fearing death which comes to us all. Violence and hatred have no part in religion which is designed to teach love and tolerance for your fellow-man. I say all this as an atheist who believes that with no religion there would be less war. Let’s all choose to learn from the mistakes of the rulers throughout history and not keep repeating them, like The Who once said “meet the new boss, same as the old boss”. Lets all choose love! This book was very easy to read and managed to keep me hooked through some long nights of reading as I was unable to put the book down. In the end I think I finished it in about 4 days. It is the story of a beaten wife who leaves her abusive husband in the middle of the night with their child, struck mute from the horror she has witnessed. They find shelter in a house with a mixed bag of damaged adults existing rather than living in a house in Hampstead. I could say that it’s a story of love and hope and it has a happy ending but it is more than that. Unusually it had surprises lurking in the pages, even to the point where my heart raced desperate to turn the page and start the next chapter – convinced I knew what would happen, only to be sent down completely the wrong path and breathing a big sigh of relief. It’s a lovely story and it touches your heart. I would say with holiday season on the horizon you could do a lot worse than spending a day in the sun reading a book like this.